For Ellipsis Monday Photo Shoot #91: Ready, Set, Go, I always knew I'd post something that featured the dogs. Well, that or preparations for mass, but I kind of forgot about that this morning until the last minute and then decided against it. I hoped to have some kind of dramatic, frozen action sequence, like the dogs preparing to jump on or off the bed, or trying to catch a fly. In the end, though, that proved too hard for me, the dogs and my camera. 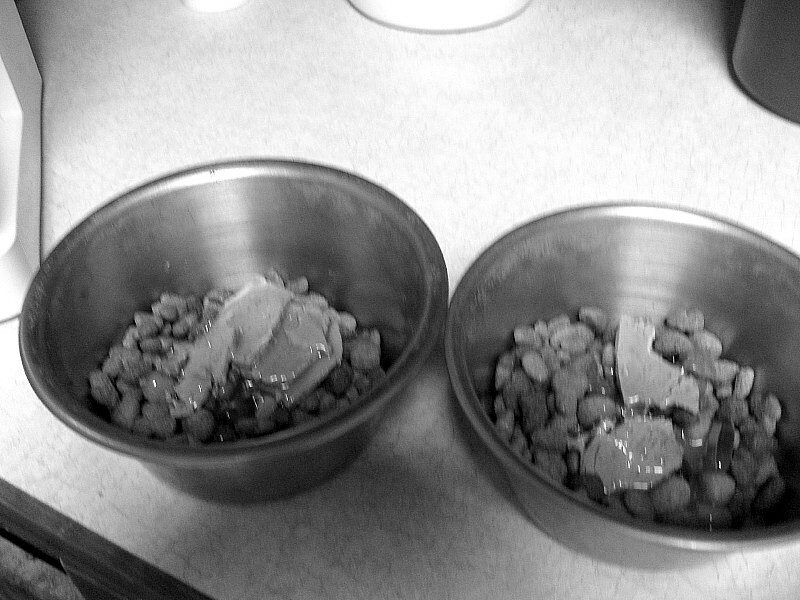 So, back up plan, devised last night: feeding the dogs their Sunday breakfast! John does the honors on Sunday mornings, and here I was, the maniac with the camera, making sudden photographic demands. 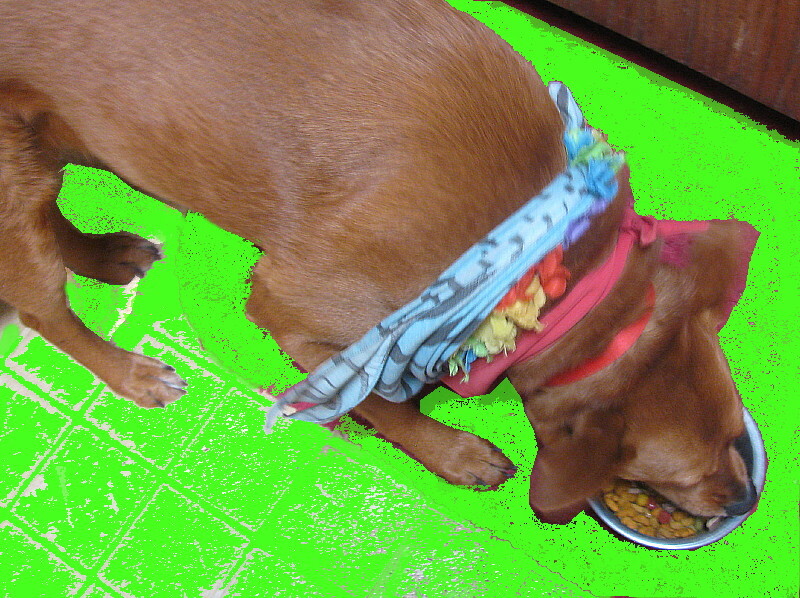 Plus John was not at all sure the kitchen was presentable enough for the posting of such pictures. In the end, I tried for something a bit experimental in my editing, partly to fit the theme and partly to allow John's concerns. I'm not sure it worked, but here are the pictures anyway! but that's just the first step in feeding them! Get set: John adds flax seed oil capsules, because we're out of fish oil. This is to combat dry skin and coats on the dogs, especially Pepper. This is version 2 of this shot (version 4, really, but who's counting?). Does the solid color work better for you? 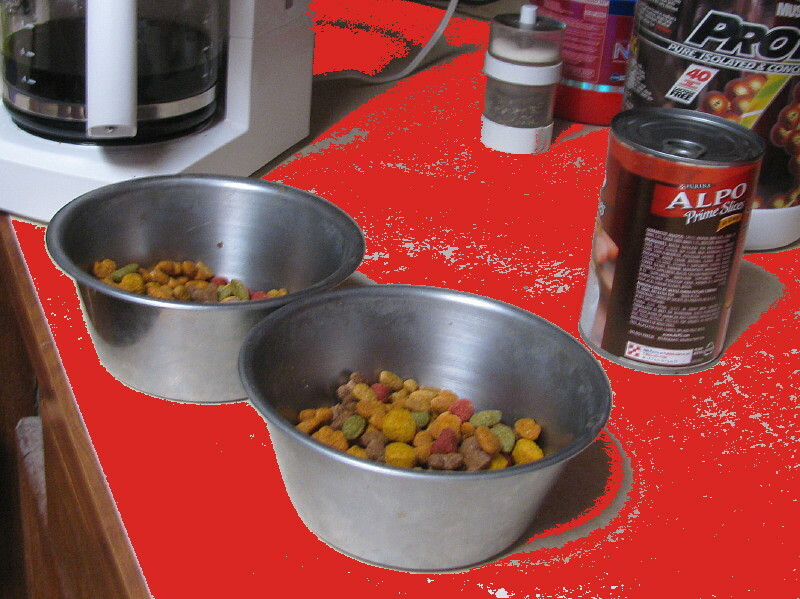 The red canister, by the way, is where we keep the Beneful so we don't have to dig into the big bag every day. Go! 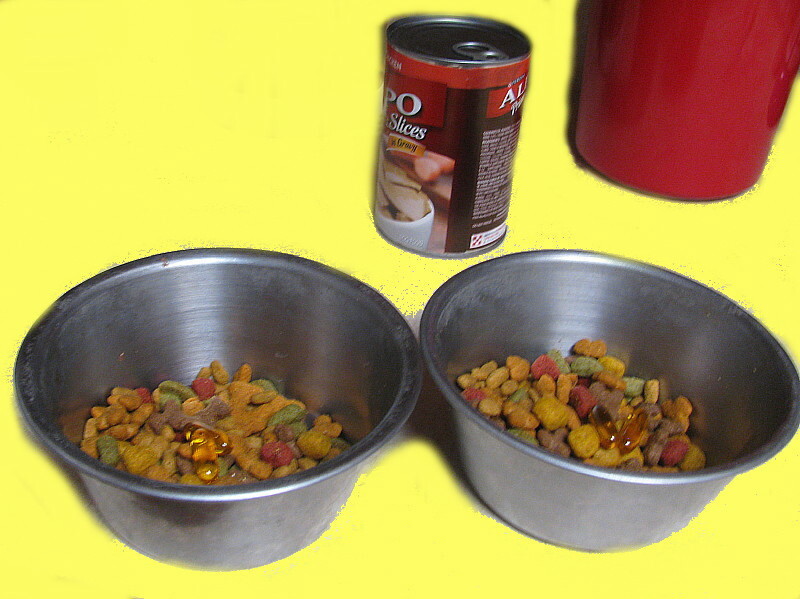 John has added enough canned Alpo "to make it interesting." 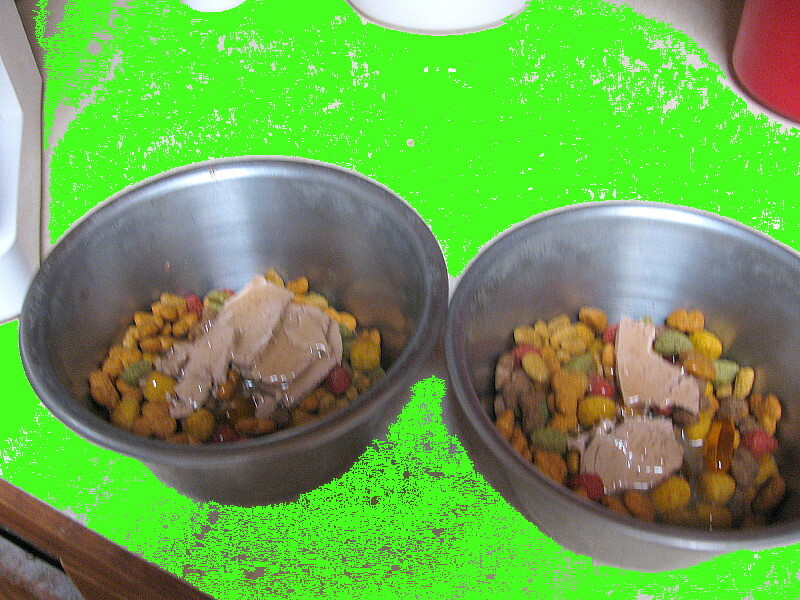 Now for the last step: put the dishes down in each dog's special spot. And go-go-go! Cayenne digs right in. nobody is going to take it away from her. Go for it, Pep! Carly also wanted to see a black and white version of a shot. Here you go. Doesn't that look appetizing? What do you mean, no? 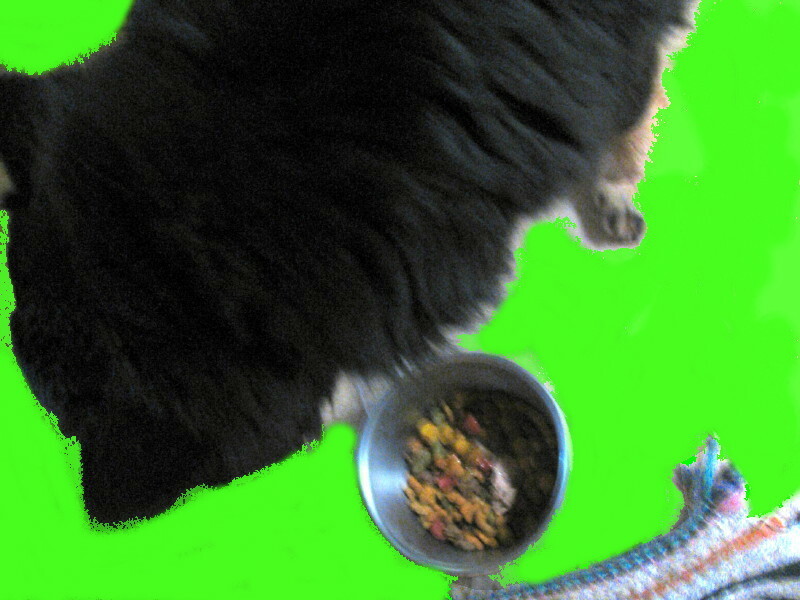 This is what Cayenne sees and it doesn't bother her a bit! Weekend Assignment #319: The Play's The Thing. Nowadays we get most of our comedy and drama from television, from movies and even from internet downloads. Perhaps we sometimes forget that all of these evolved from a much older art form, the stage play. Do you ever attend plays, musicals or operas? Why or why not? Extra Credit: Have you ever seen anything by Shakespeare performed live? Sad to say, I hardly ever get to any sort of live performance these days, aside from the occasional convention appearance by a writer or actor. The last live acting I saw in person was an outdoor Dillinger Days reenactment in January 2008. I've been working through my memories this afternoon, and the most recent play of any sort that I attended was a Gaslight Theatre show circa 2006 or early 2007. That hardly counts, I think. As I wrote a year ago, the Gaslight's stock in trade is deeply silly musical melodrama pastiches, full of puns and send-ups and satire. The last Gaslight show I went to, courtesy of First Magnus in the days when they were riding high on the housing bubble, was Sgt. Preston of the Mounties, or Yukon Count on Me. It was a lot of fun, and I'd like to go again sometime, but somehow it never seems important enough to spend the time or money to do so. And that's the basic problem: money. The big touring companies charge so much per ticket (because they have to) that I can't justify the cost of a ticket, even for a show I really want to see. On the other hand, smaller productions don't even hit my radar. But I have seen Shakespeare performed, twice. The first time was way back in 1974, on a school trip to New York City. The play, The Tempest, was one of my favorites. This particular production, at the Lincoln Center's Mitzi Newhouse Theater, starred a familiar-looking young woman as Miranda. Carol Kane had just appeared in a comedy melodrama Dr. Pepper ad. Within a year or two she would be famous for her role as Simka, Latka's significant other on Taxi. I enjoyed the play very much, far more than the other two shows I saw on that trip: Carol Channing in a dreadful show called Lorelei, and the Madame Butterfly at the Met. Glorious as the music of that opera may be, I was really annoyed by the title character's relentless (and by today's standards, needless) suffering. More recently, but not recently enough, John and I saw an RSC production of A Midsummer Night's Dream in Stratford-Upon-Avon, circa 1994. I was a little thrown by the sparse set design, which consisted mostly of three rope swings hanging from the rafters, but other than that I liked it a lot. For me, the pastoral comedies are the most accessible and enjoyable of Shakespeare's works. Call me a philistine, but I generally don't like tragedies. They're depressing, and too often it seems that the characters could get out of their predicament if they just behaved more reasonably. Still, there is one Shakespeare tragedy I'd like to have seen live in 2008. 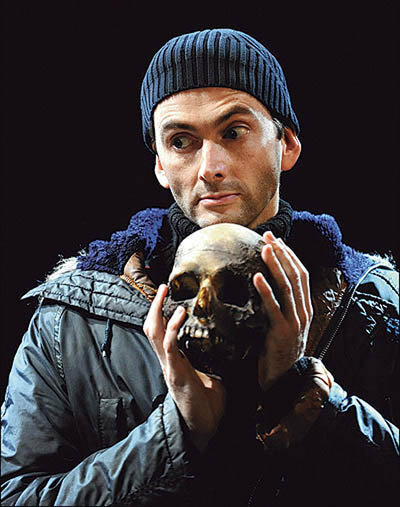 It was my least favorite Shakespeare play, Hamlet, starring my favorite actor, David Tennant. I recently got to see most of the BBC film of the production on PBS, starring Tennant as Hamlet and Patrick Stewart as both the murderous king and his ghostly brother. 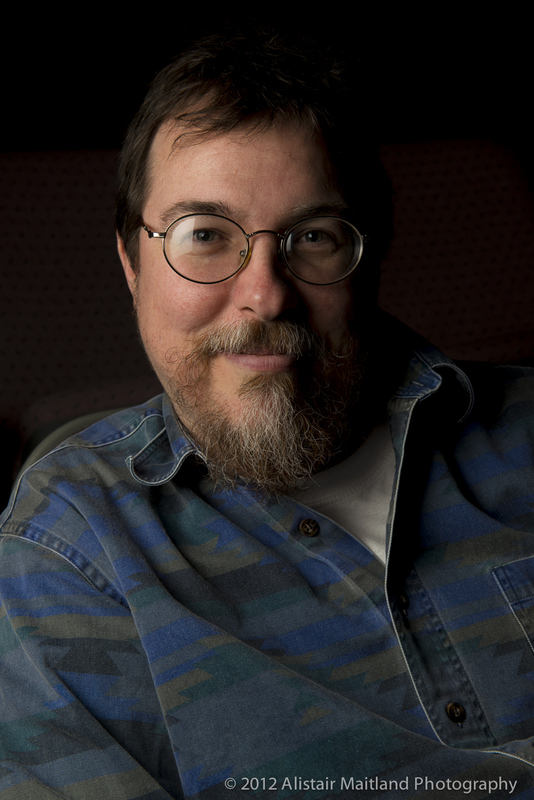 It was a modern dress version of the play, with Hamlet sometimes in a t-shirt, sometimes in evening clothes, often brandishing a handheld video camera. I still dislike Hamlet's whiny indecisiveness, but this particular cast and director made for a fascinating, eminently watchable update. For Round Robin Challenge: Statues, I asked folks to "photograph a statue of some sort. It can be as large as the Sphinx in Egypt, or as small as a bowling trophy." When I first proposed the topic two years ago, I had already photographed a number of statues, some for a "Public Art" Challenge, others for other reasons and purposes. This time out, though, I want to focus on the confluence of statues, religion and history. 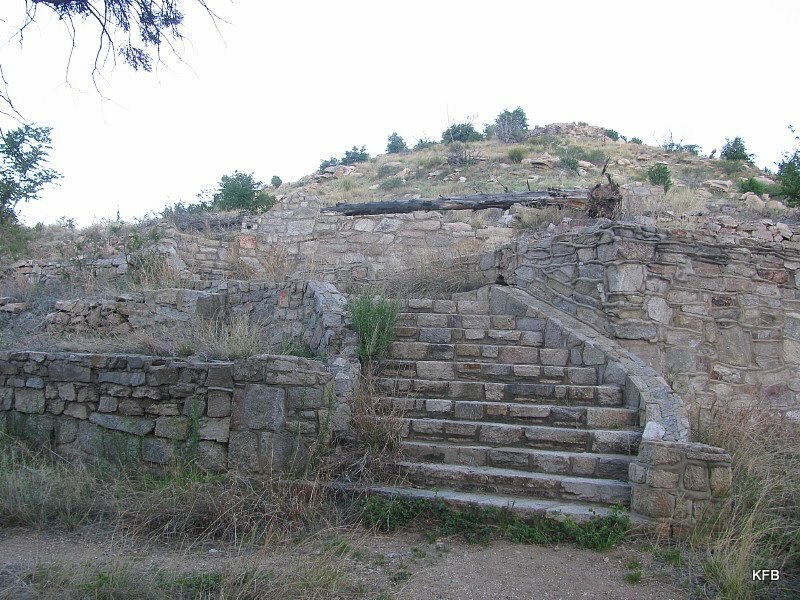 After all, I live in Tucson, where religion played a pretty large role in local history. When people want to commemorate historical figures, they often do the same thing as people who want to commemorate saints. They make statues! Let's start at good old St. Michael and All Angels Church, established in 1953. 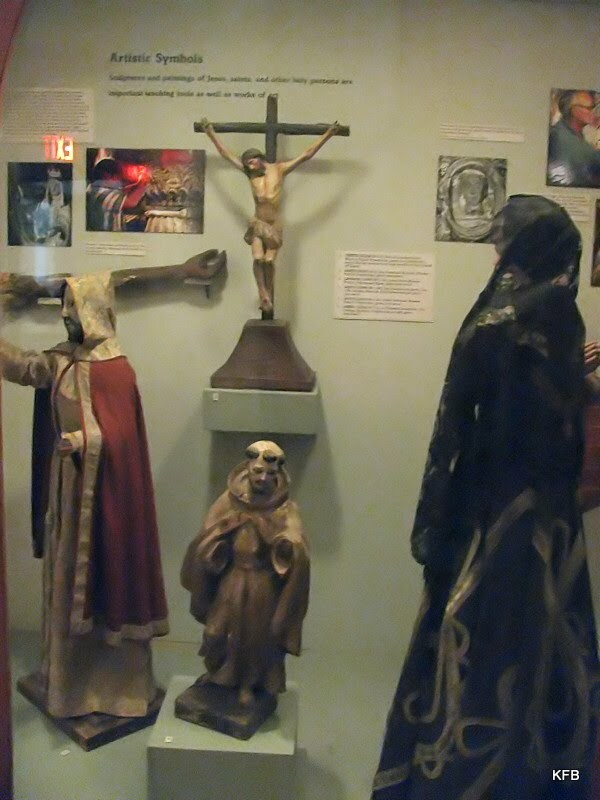 The place has more than a few items of donated religious art, including a number of statues, more properly called icons. Some of them are in better shape than others. My absolute favorite is one that's tucked away in a cardboard box, under a table used to prepare bags of food for the needy. It seems serenely unconcerned about its headless condition as it blesses the work that sometimes goes on above it. And here is St. Michael himself, looking a bit cherubic as he guards the west side of the memorial garden. Here is a statue I've wanted to photograph for about twenty years, but didn't until today. The man on the horse is Eusebio Francisco Kino S.J. 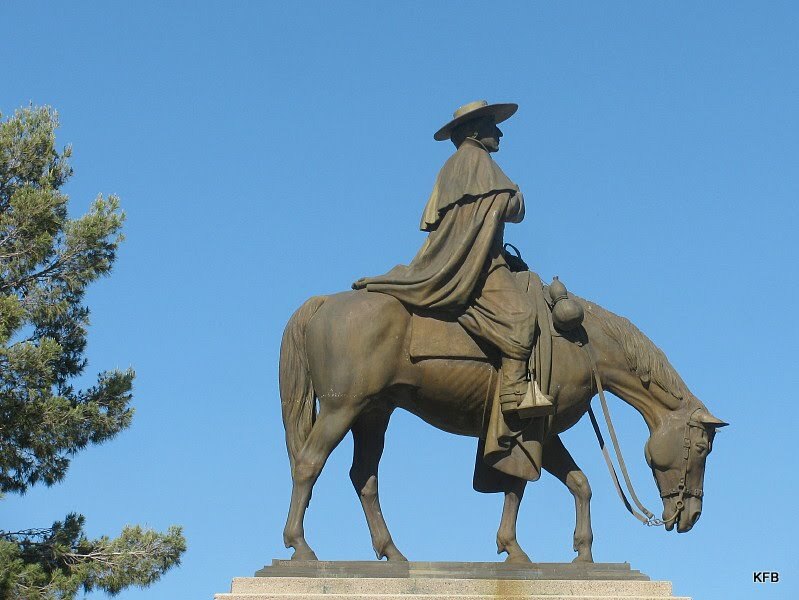 (1654-1711), best known to Tucsonans as simply "Father Kino." It amuses and frustrates me that the hat the man wore to keep the sun off his face performs the same function on his statue. The artist, by the way, is Julian Martinez of Mexico. The statue is dated 1988, two years after we moved out here. 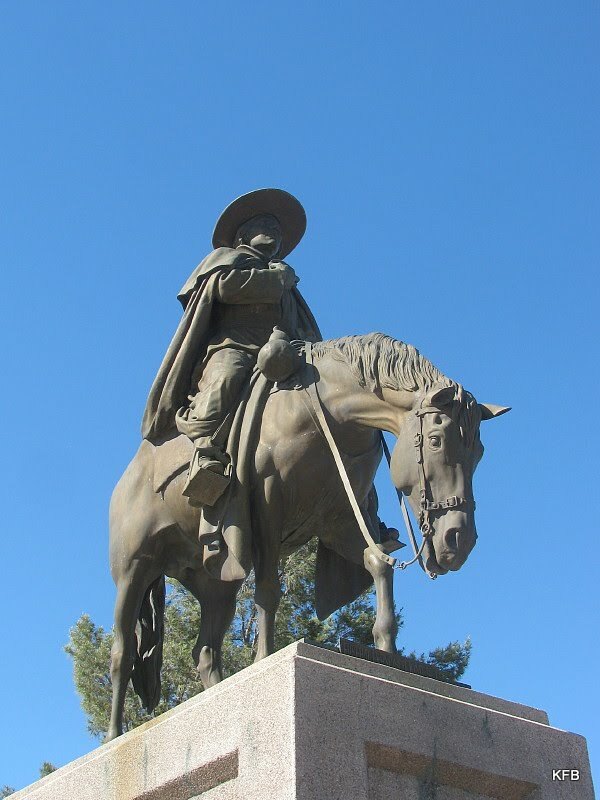 A Jesuit missionary, Padre Kino traveled around the Southwest on both sides of the modern border between Mexico and the U.S., bringing Christianity and farming techniques to the indigenous peoples he found there. Unlike the Spanish Conquistadors, he opposed the exploitation of the tribes as a source of forced labor. 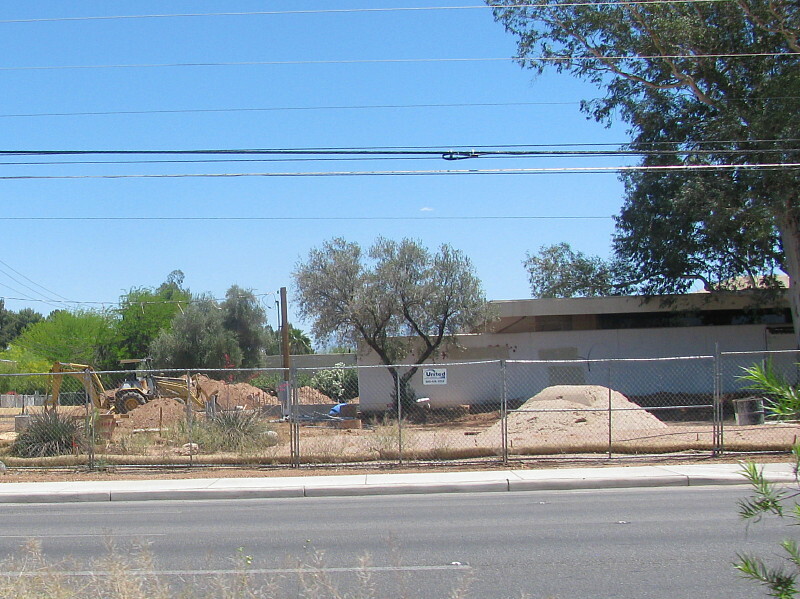 Father Kino's travels led to the development of roads in the region, and the eventual establishment of Tucson as a non-native settlement. 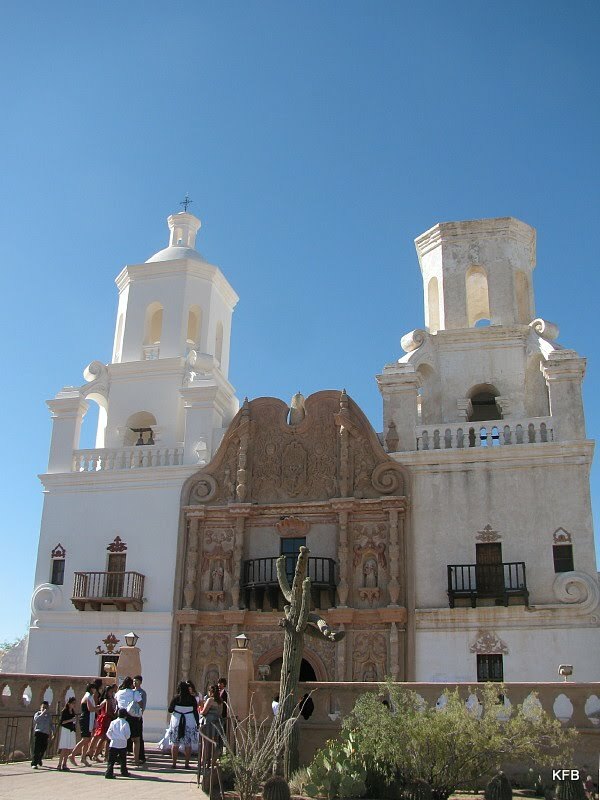 One of the Missions started by Father Kino was Mission San Xavier del Bac, nine miles south of Tucson. The present church was built by natives nearly a century later, in the late 1700s, under the direction of Franciscan priests. 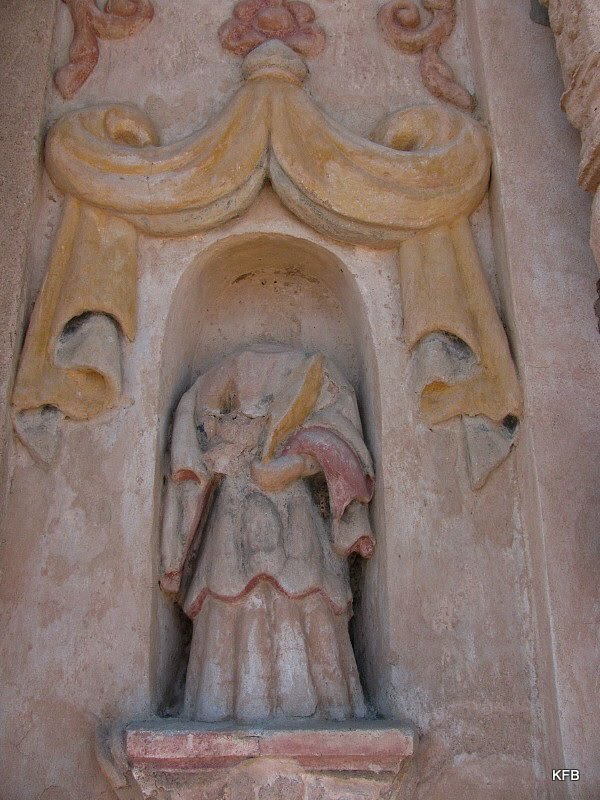 Little is known about the designers and artisans behind the many ornate details, including the four statues you can see in the photo above, in the reddish central section of the front of the mission. Today the church serves the Tohono O'odham Nation, descendants of the original local population Father Kino served back in 1699. Like the Saint Under the Table, one of the statues in the alcoves in front of the mission has lost its head. Inside are many religious icons, statues and frescoes, most in better condition than the headless saint. I was only at Mission San Xavier del Bac for about ten minutes today, but I got a few more decent shots you may care to check out. One of these days I'll make a proper visit and do a full gallery of images from this historic treasure. 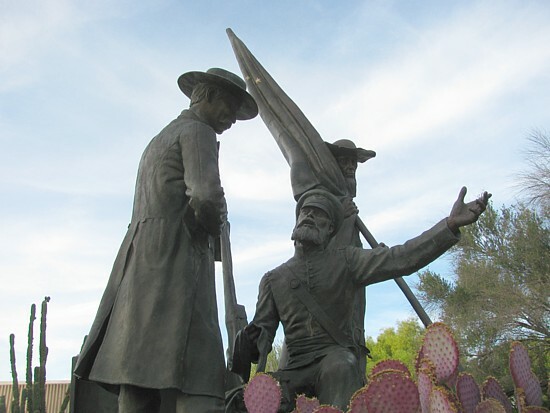 And lest you think only Catholics are significant to the history of the Southwest, here's a closeup of the Mormon Battalion Monument in El Presidio Park, behind the old courthouse. Now let's go see what statues the other Robins found! Cheryl Ann **Welcome, New Player** - Posted! Tonight was the 31 year anniversary of the day John and I got married. We had intended to go out to dinner, but John was hemming and hawing over the specifics. As he flicked through a few cable channels, away from an annoying interview with Rand Paul, he happened upon two local news stories on the same subject. 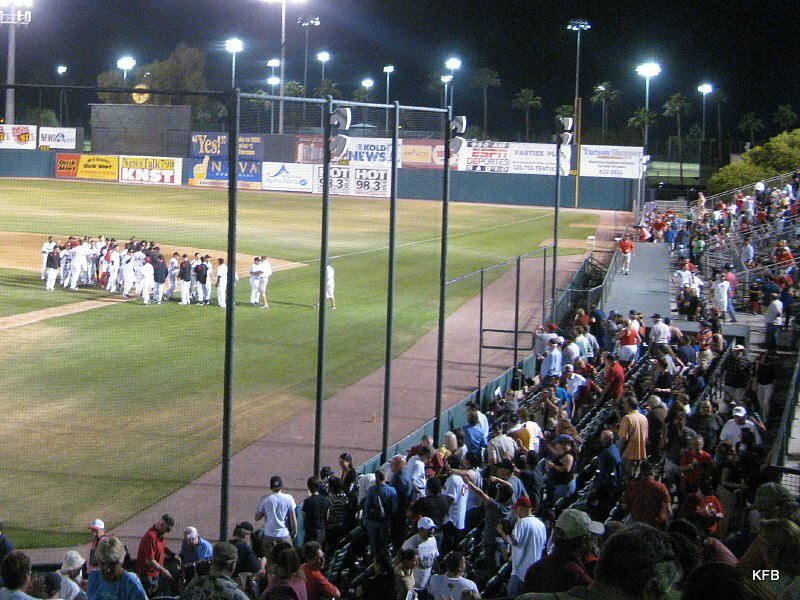 It was Opening Night for the 2010 Tucson Toros! 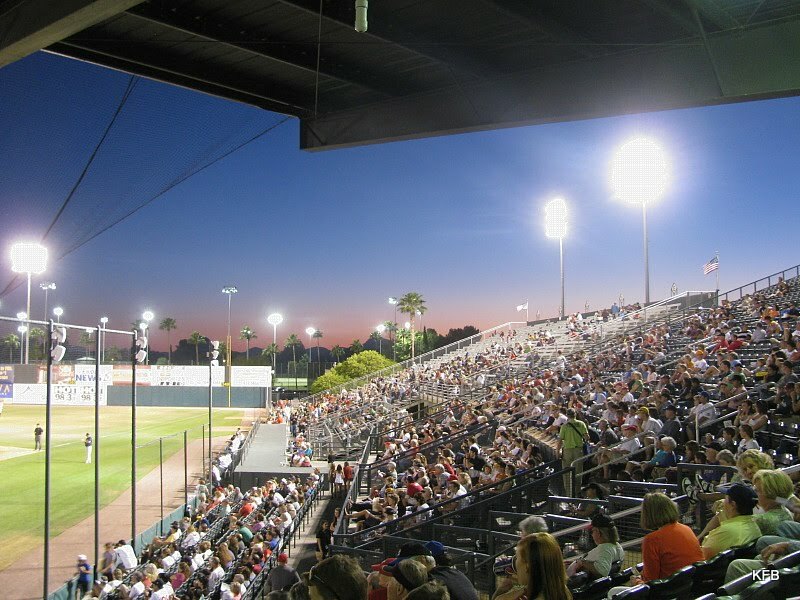 It took us about two minutes to scrap our nebulous dinner plans, and decide to head out to the ballpark instead. On the way out the door I grabbed fresh AA batteries for my camera, because I had an idea for this week's Ellipsis Monday Photo Shoot #90: Sides. 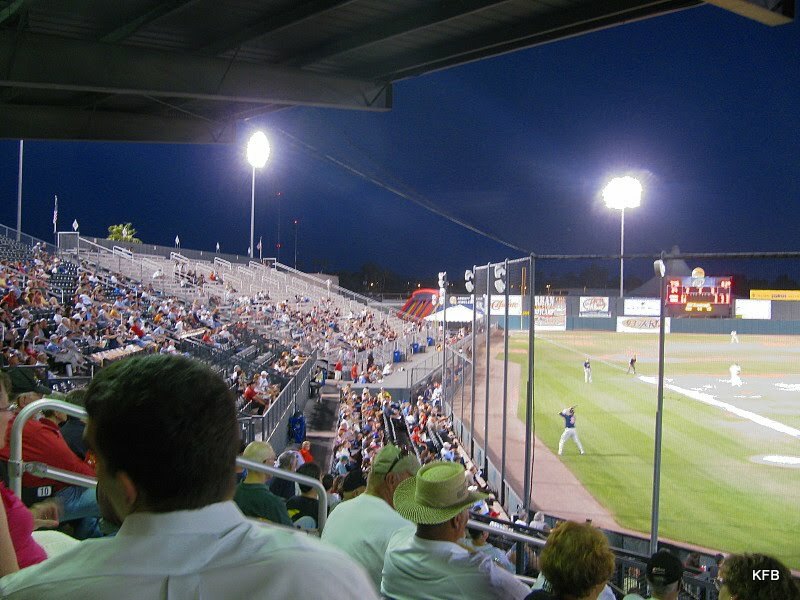 How about taking sides at a baseball game? Action shots at sunset are not my camera's forte. Being foolishly concerned with eating the chicken Caesar salad I'd chosen over hot dogs or a barbeque sandwich, I didn't really start taking pictures until daylight began to fade. 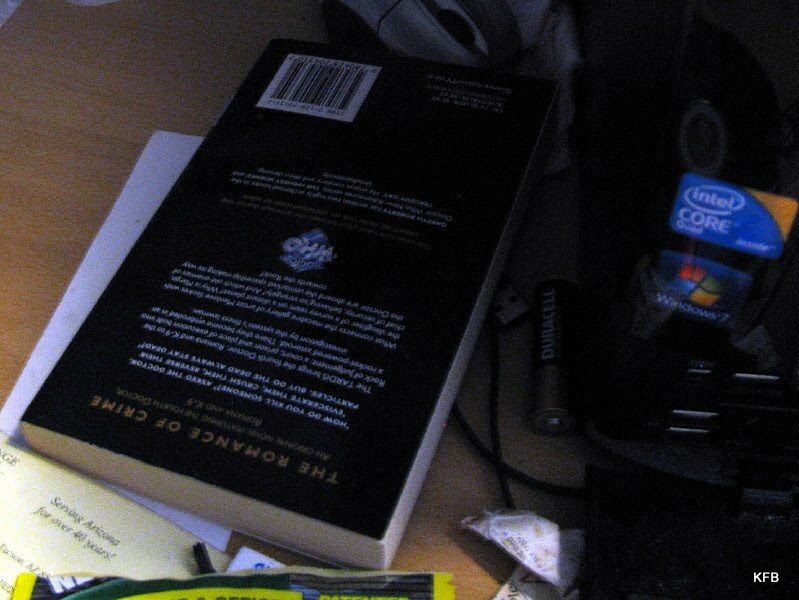 This is a problem for my camera, which really doesn't do low light conditions very well, especially for action shots. But I tried. 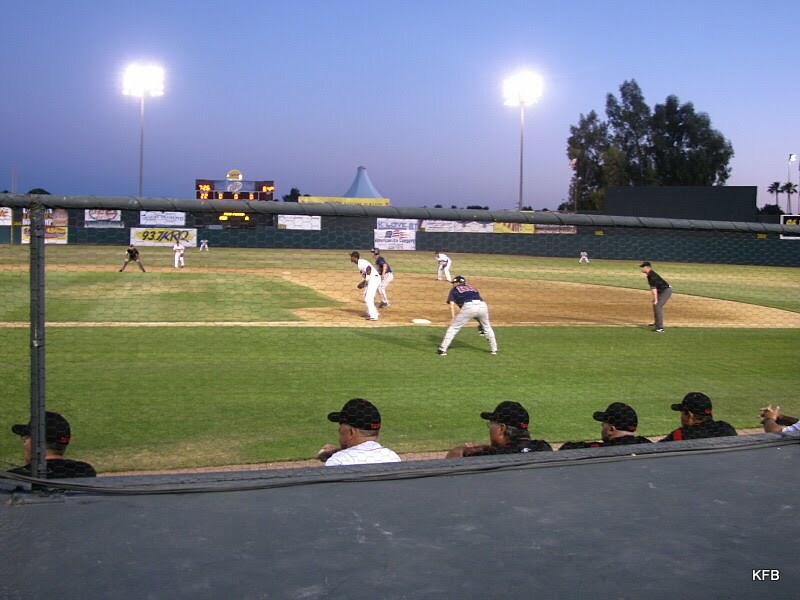 Toros players and coaches watch from the sidelines. A good size crowd on the first base side. A bit less of a crowd on the third base visitors' side. Eventually I discovered a setting on the camera that helped a lot. Hey, I've only had the thing for a year. So how was the game? Scroll DOWN to Part Two for the answer. I'm breaking my EMPS entry into two parts this week. This is Part Two. Scroll UP for Part One. As I mentioned in the entry I'll be posting about two minutes after this one, the theme for this week's EMPS is Sides. The term applies in a couple of ways at a baseball game like the one John and I attended tonight as our 31st wedding anniversary celebration. 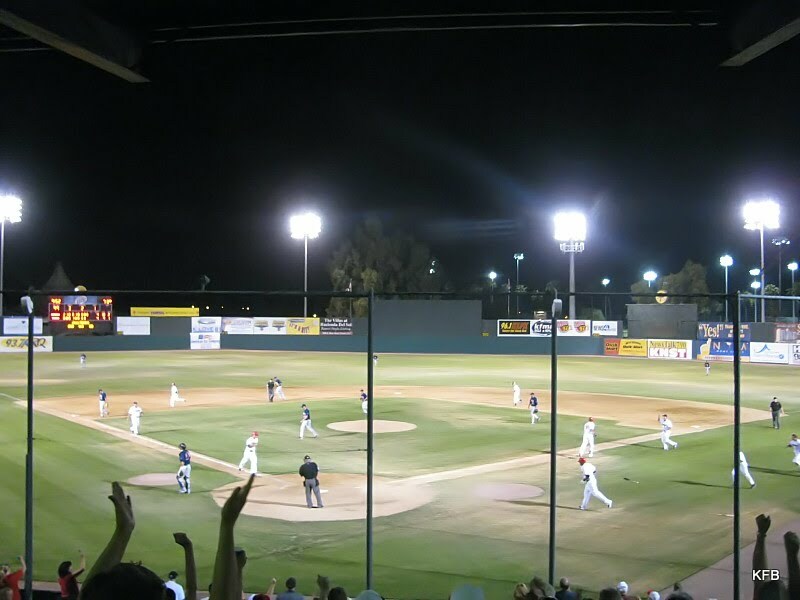 The right and left sides of Hi Corbett Field, and ballparks generally, are referred to as the "First Base side" and the "Third Base side," or the "home team side" and the "visitors' side." And of course we take sides at sporting events. We're supposed to "root, root root for the home team," right? But tonight it looked as though we were heading for "If they don't win it's a shame." 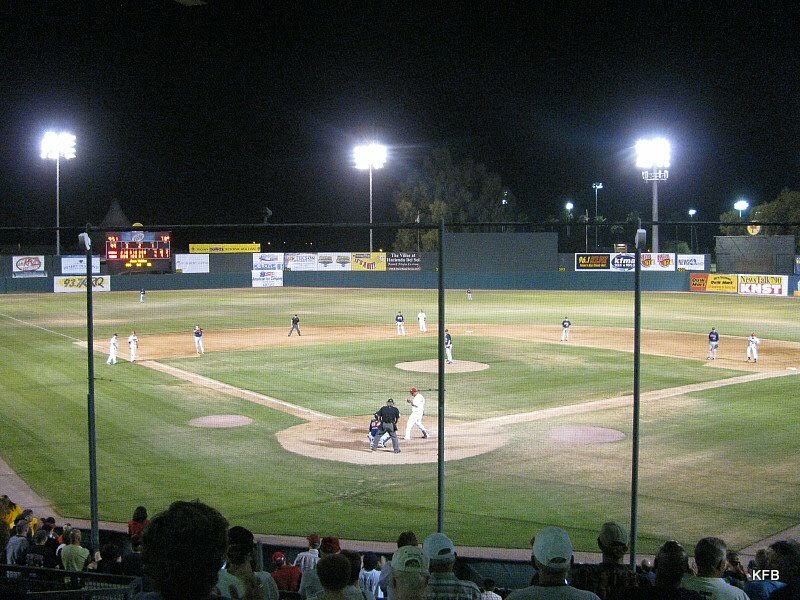 Toros starting pitcher Vince Davis gave up four runs in the first five innings, and the Toros batters only managed to score once in seven innings. score only one run in seven innings. with a 3 RBI triple! "Wally! Wally! Wally!" the crowd chants. Suddenly it's a ball game! 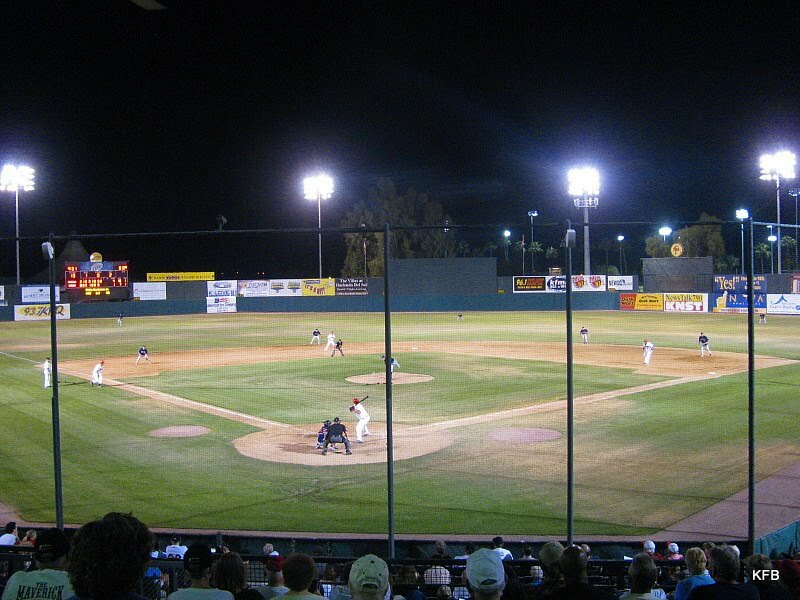 And the relief pitcher, Andrew Snowdon, celebrates his first professional ball game by striking out four batters in two and two-thirds scoreless innings. Way to go, kid! These late game heroics lead to a classic bottom-of-the-ninth battle, which I persuade John to stick around for. 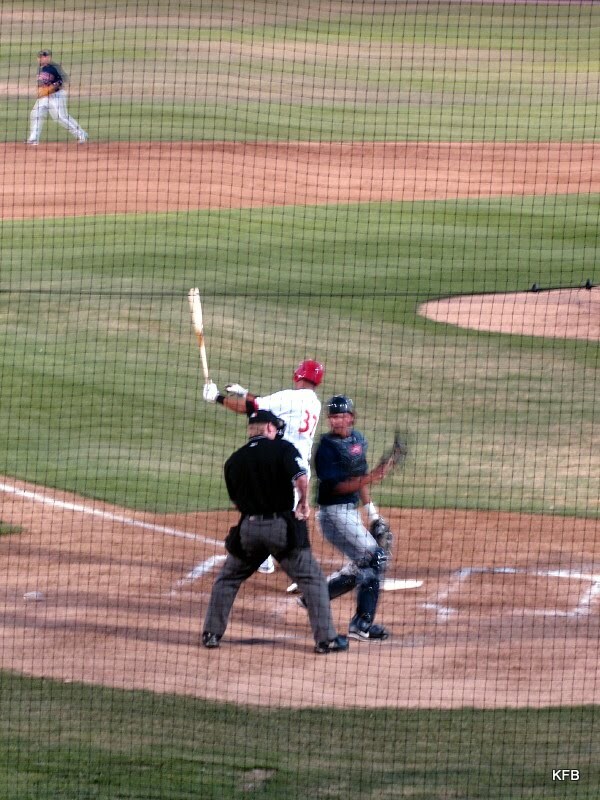 With Toros at second and third base, the Calgary Capitals intentionally walk Josh Womack, who has no hits on the night. 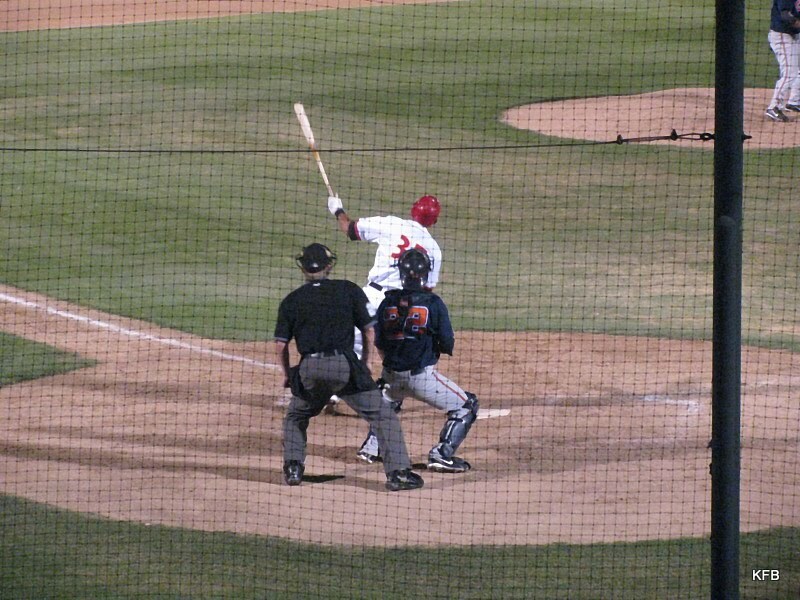 Jose Valdez, also hitless, steps to the plate. Bottom of the ninth: full count, tie score, one out, bases loaded! The opposing pitcher walks in the winning run! Toros Win! 5 Runs, 9 hits, 1 error. Party on the First Base side! Recently, it was discovered that George Washington had forgotten to return some books he had checked out of his local library. They were only 221 years late, mind you, but late all the same. How about you? Have you ever checked out a library book and forgot to return it? Tell us about your experiences with checking out, returning, or forgetting to return, books to the library. Extra Credit: Tell us about the last book you checked out of the library. See, this is one of several reasons why I don't go to libraries any more. I don't like the pressure of having to finish with a book by a certain date and return it. In fact, I'd rather not return a book at all. It was one thing to borrow a few dozen books each by Walter Farley and Jim Kjelgaard (not all at once, of course!) when I was in fourth grade. That made sense, because what kid can afford to buy a prolific writer's entire output? Manlius Public Library and Fayetteville Free Library were very helpful when I explored the science fiction genre in high school, and Bird Library at Syracuse University helped me out when I needed to read English translations of books I struggled with in a French literature class. As an adult, though, I want to own the book, even if it means being far more selective about which books to read. Most of the books in my personal library are ones I've read at least twice, in some cases a dozen times or more. If I decide at three in the morning that I want to reread The Sword in the Stone or Dragonsong, I can do it. Thousands of books, no waiting. Reading a library book, in contrast, requires making time in the day when the library is open, going over there, and finding a book that a) I want to read, and b) that library actually owns. In my handful of visits to Tucson libraries since 1986, I've found very little overlap between a) and b). And that's fine, really. The money available for library acquisitions these days is far from abundant, and spread across far more media than just books. Buyers aren't wasting their limited funds trying to entice an over-specialized reader like me into their libraries. They need to serve the general public with bestsellers and I suppose the occasional classic, replacing some old copy of A Tale of Two Cities that's no longer worth repairing. I suppose it's a shameful admission to make, my lack of library patronage. One of my best friends from college is a head librarian Back East, and John was a library technical assistant for something like seven years when we lived in Columbus. I do believe in the mission of libraries. I really do. But they just aren't for me any more. My last visit to a public library was to attend a lecture on modern architecture in Tucson, at the library next door to St. Michael's, roughly five years ago. That same library, itself an example of midcentury modern architecture, now stands empty and more or less gutted as it awaits renovation. My last library visit before that was to a University library, where I did my homework for an accounting class and tried desperately to stay awake until John was finished with whatever it was he was researching. 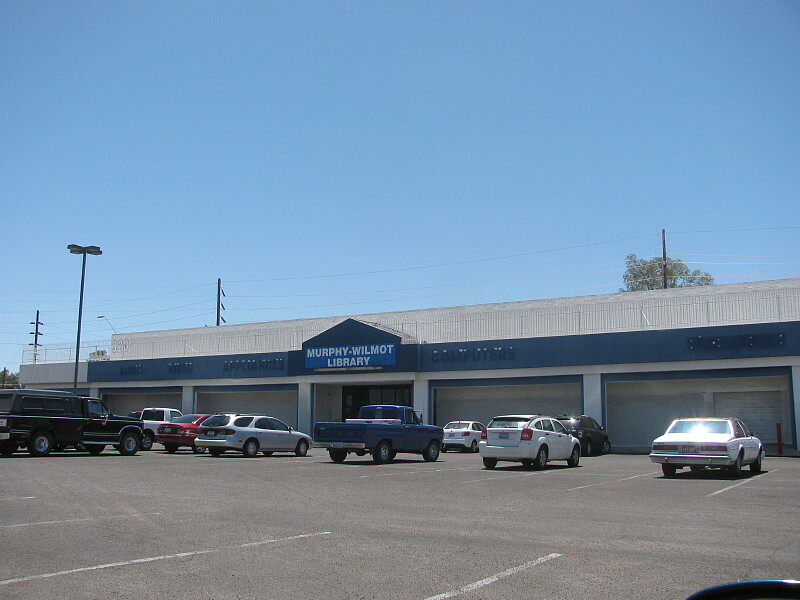 Wilmot Library's temporary location, next to Park Place Mall. So what was the last library book I borrowed? I really don't remember. It was probably close to ten years ago. I think it was non-fiction. Something TV-related? Music? Lives of the Saints? I have no idea. What I do remember is that I didn't look at the book from the time it left the library until the day I returned it - late. My only strong memory about returning a library book took place about 45 years ago. The book was Harry the Dirty Dog. After my mom and I returned it, the librarians discovered that some child had scribbled in it in crayon. I didn't do that, honest and truly, and I don't know who did. My mom didn't believe me. And that's the only reason I remember the incident: it was the start of a major bugaboo of mine, resenting false accusations like that one, however innocently made. I've decided to shock everyone, and post my response to the Ellipsis Monday Photo Shoot #89: Nautical on an actual Monday. I used to do this back when John Scalzi was hosting the meme, but in recent years I've let it slip rather badly. Now, when I first saw this topic, I was stumped. After all, I live in the desert! The nearest ocean is over 400 miles away, and I never get there. I'd have to go back to 1986, most likely, to find a photo of a boat, and most of those photos were taken by John. 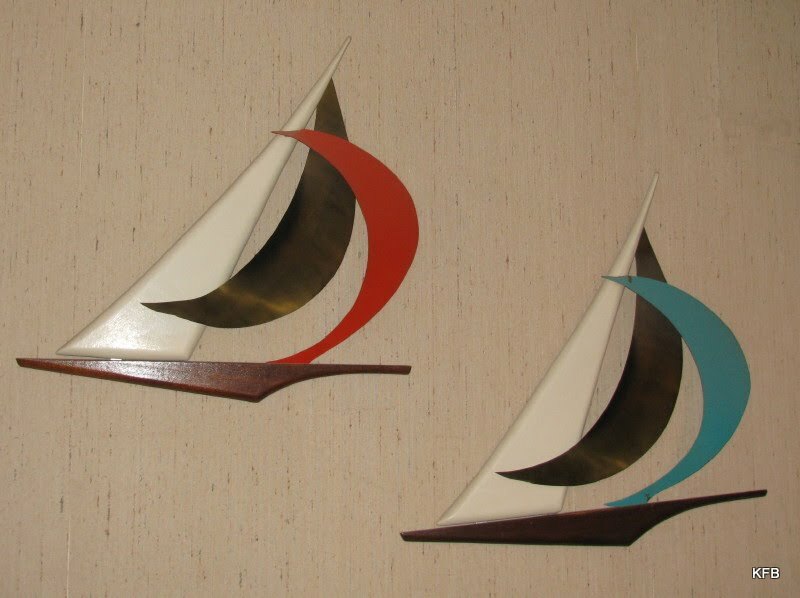 This sort of thing was classic 1950s decor, right down to the color scheme. Yes, I know they're a little crooked. I can't reach them right now to straighten them out. 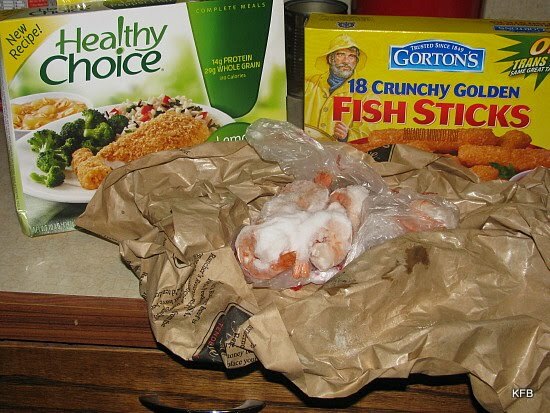 ...including fish sticks for my next round of fish custard, and some severely freezer-burned shrimp! How about some piratical jewelry? 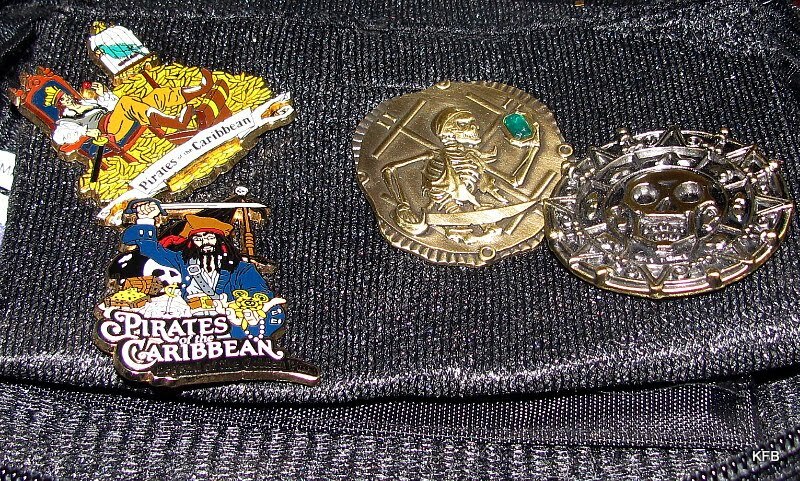 Black Rose Kate and her nautical, larcenous accouterments are not around at the moment, but as you see I do have these pins from Disneyland's Pirates of the Caribbean attraction. There's also the fact that my mom used to life in a beachfront condo. Perhaps there are some seashells in with her jewelry. Yup - found 'em! 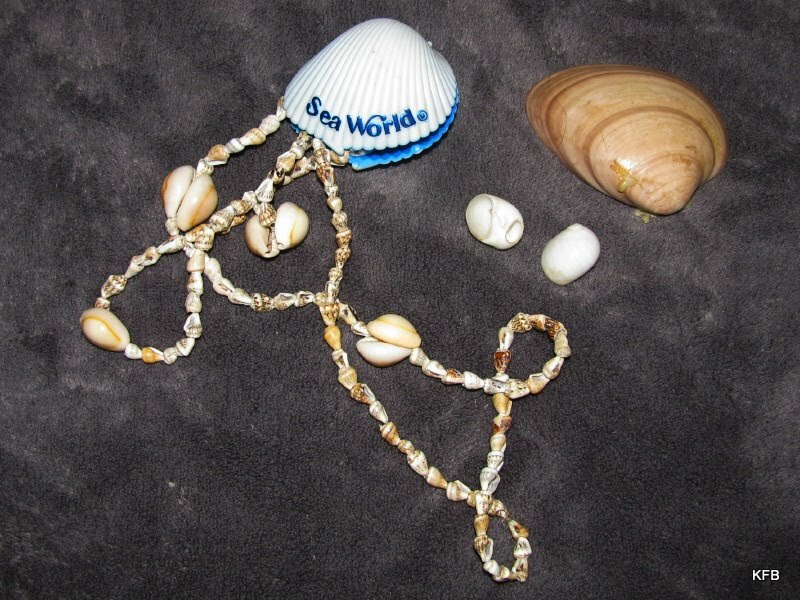 The Sea World clamshell box comes from a pearl diving attraction at Sea World San Diego, probably in 1986. I'm not sure what the gunk is on that one (real) clamshell, but I hope I didn't get it on John's grey blanket! Finally, there's one guy who can almost always be counted on to wear his sailor suit! 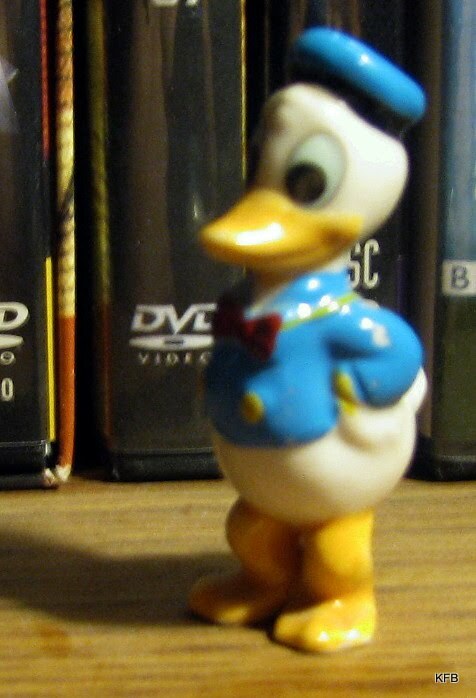 This tiny Donald Duck figure was hard to focus on properly, but you get the general idea. Best I can do from the middle of the desert! 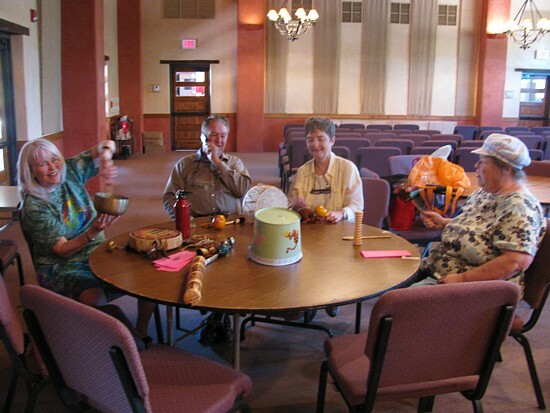 People used to socialize with each other on street corners, at cocktail parties, at club meetings, and in a later era, at shopping malls. These days, however, we seem to do most of our socializing online. 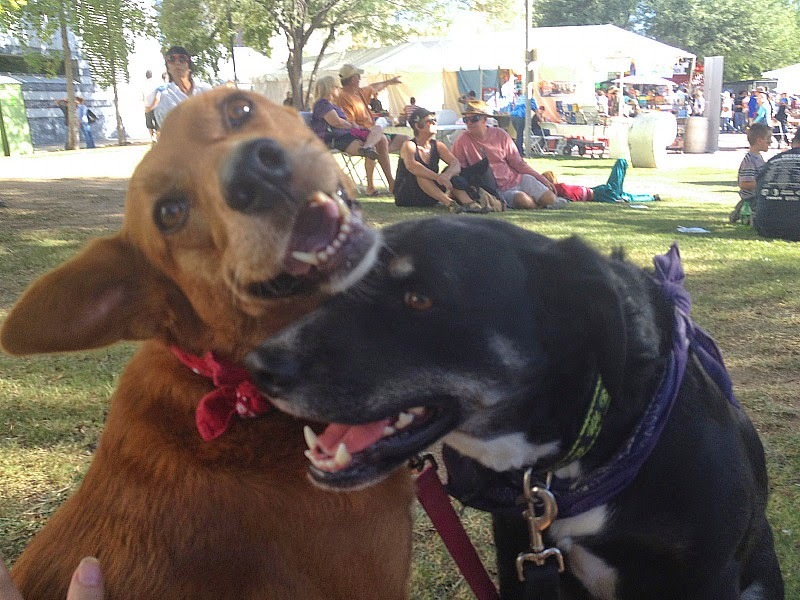 Where do you go most often for face time with friends and acquaintances? Extra Credit: Do you ever hang out with co-workers after hours? There was a time, throughout the 1990s in fact, when I got to hang out with friends in two different but overlapping fan clubs, one for Doctor Who and one for Quantum Leap. 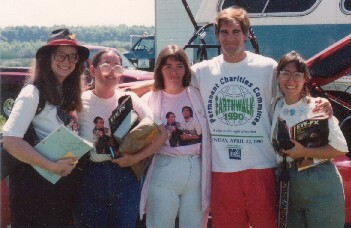 The Murray twins, Dimitra C. and I, or some portion thereof, drove to California on a number of occasions to attend conventions and/or interview Quantum Leap's actors, writers, producers, etc. Back at home, Teresa Murray and I used to write, transcribe and edit the club fanzine, The Observer, and (in the early days of the club) process memberships. Eventually the tv show was canceled, and we handed over membership and fanzine duties to the same people who are handling them today, all these years later. Meanwhile, our local Doctor Who club lasted almost exactly a decade before falling apart due to people moving away or losing interest. The last time I saw anyone from the Who club, aside from my friends Kevin and Samantha whom I see every week, was at Linda H.'s birthday party last September. 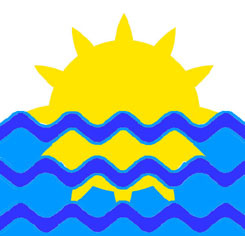 Those two clubs made most of the 1990s a great time it for me, full of friendship and adventures. 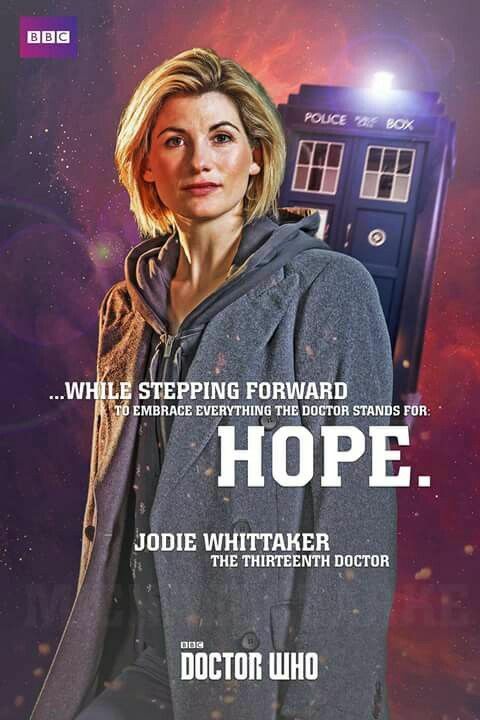 During that period my Doctor Who fan experiences also led to my first professional writing credits in a decade, co-writing articles with Teresa for Starlog, and writing the backs of Doctor Who trading cards for Cornerstone. Then it all went away, with me disengaging from Quantum Leap fandom and most of my Doctor Who friends leaving town for one reason or another. So what do I do these days by way of social interaction, aside from the occasional email or instant message, and sending virtual gifts in Facebook to people who are no more than names to me? This is may sound a little pathetic or misguided, depending on your point of view, but it's the truthful answer. I go to church. Almost every day, in fact. No, I don't mean that I go to Mass every day. When I was a kid, I was aware that St. Ann's Church in Manlius held masses every morning, but all those weekday masses were, as far as I could tell, meant for and attended by a handful or little old ladies in their pillbox black hats with little black veils. Here in the present, St. Michael's doesn't always even offer masses every single day of the week, and when it does, I'm mostly a no show. I attend on Sundays, of course, and one Saturday a month because it takes place in between the finance and vestry meetings, and on most but not all major holy days. This week, for example, is Ascension Thursday, with an evening mass followed by a pot luck in the Parish Center. I'll be there, assuming I remember! 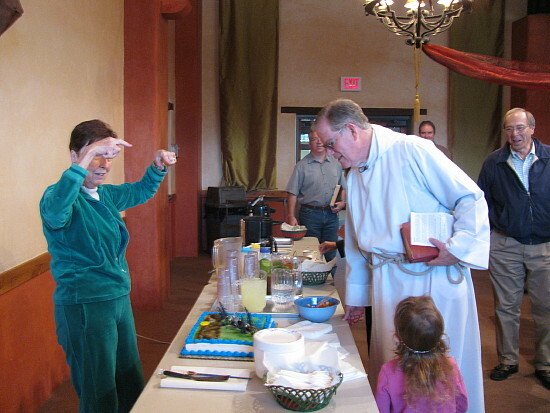 Here's where we start to get closer to the point of my long-winded answer, because Life at St. Michael and All Angels, as the blog title goes, includes much more than sitting through thirty to ninety minutes, depending on the occasion, of prayers, incense and sermons. I carry the cross or a torch at Mass nearly every Sunday morning, but when mass is over, I'm still on the St. Michael's campus (or, as Father Smith sometimes jokingly calls it, "the plant"). By 11:30 AM or so, Kevin and I are sitting at one of the tables near the front of the Parish Center, usually chatting with Jan or Mary or both, and perhaps a few other people. I'm drinking an Arnold Palmer, having "invented" the mixture of ice tea and lemonade a few years before learning at Coffee Hour that the combination was already well-known, and named after a famous golfer of a generation ago. I probably have a few cookies on a napkin, having rationalized that anything eaten at Coffee Hour doesn't "count" with respect to dieting. And around the table we're talking about, well, any number of things, from vampire novels to the biology of sociopaths, from collectibles to call center jobs, from specialty knitting needles (and I don't knit, at all) to the Purple Conspiracy. While all this is going on, people are asking me to take pictures of some person or object, and sometimes we have to table our private conversations in favor of a presentation on immigration issues or the plight of poor people in Haiti or Guatemala or elsewhere. Maybe instead there's a bake sale that week, or a bazaar with goods from around the city and around the world. And most weeks I'm touching base with Father Smith or Pat Miller about some job-related point of information - because St. Michael's is also where I work part time, the only job I have at the moment. That's where the rest of my weekly socialization comes from, aside from Coffee Hour on Sundays and watching tv with John at home. Most weekdays I stop by sometime in the afternoon, check in with Nancy or Alicia, the Parish Administrators, and say hi to that day's office volunteer. As I put in a few hours of work, people stop by to drop off or request bags of food, to get a key and permission to use the library or practice the organ, to drop off and pick up notes and mail for various church organizations, and to arrange for weddings or funerals. Father Smith may be around, depending on the time of day and day of the week, in which case I usually try to grab a few minutes to consult with him about one thing or another. I might ask Nancy about her foot surgery, or chat with Mary B. about Syracuse weather or Les S. about First Magnus, or Jim P. about whether we owe him money to fill in a grave. One volunteer drills her grandson in his spelling homework every week in the room next to my office. I listen with interest, even though that child, who has seen me every week for 11 months, has never yet said hello to me. But what the heck. It's all good, a chance to interact with people who are mostly older than I am, and a few who are younger, in service of a local institution that tries to serve God and our neighbors around the world. Is it any wonder that I mention St. Michael and All Angels Church just a little too often in this blog? Oh, and yes, I do spend at least a little time with Father Smith, Pat, Alicia or Nancy when I'm not working, but most of it, you guessed it, is at church! I did attend a church outting to a Sidewinders game with Father Smith once, though. This first one I may have cheated on; I don't remember now. 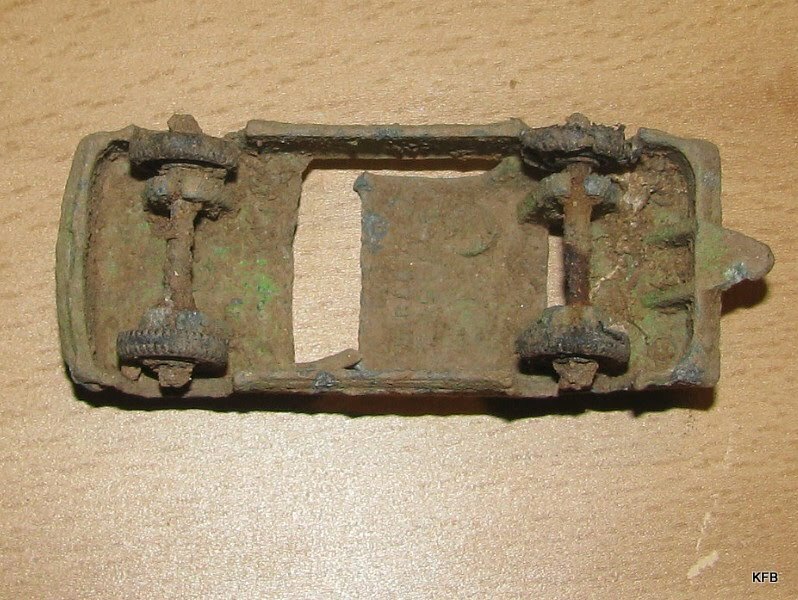 It's an old Matchbox-style car that John found while digging in the yard. It's highly corroded, but that's what makes it interesting. This is one of a number of books that are floating around right now because I got them out to read, only to get distracted or lose interest. It's The Romance of Crime by Gareth Roberts, a Doctor Who novel in the Missing Adventures series from the 1990s, starring the Fourth Doctor (the guy with the scarf) and Romana (the second one). Gareth Roberts went on to write episode for both Doctor Who and a spinoff series, The Sarah Jane Adventures. I'm pretty sure I read and enjoyed this original novel when it first came out, but for whatever reason I wasn't really in the mood for it when I got it out again recently. I really should put it back in my Doctor Who bookcase! 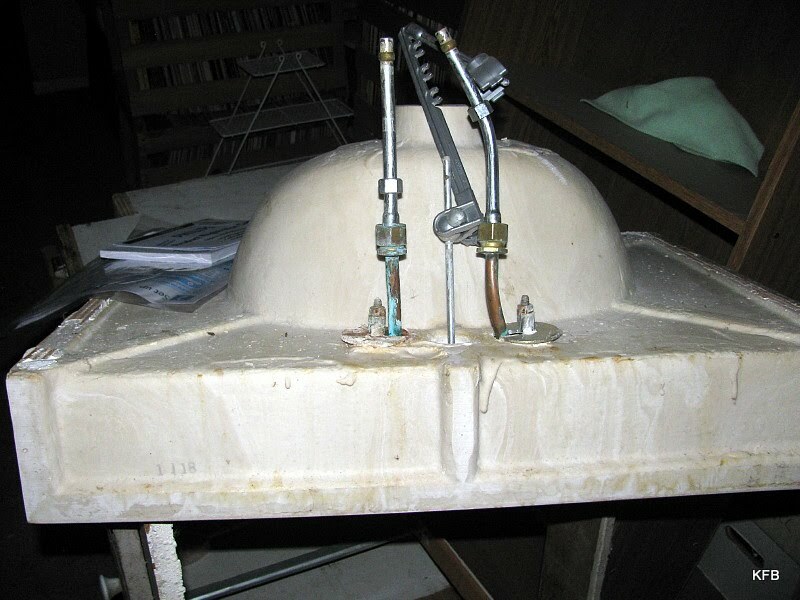 This old bathroom sink is sitting in our front room right now, a relic of John's bathroom renovation in progress. To say "in progress" is to be generous; he only works on the project intermittently, having neither the time nor the money to do what needs to be done. That's not likely to change until I get another job. 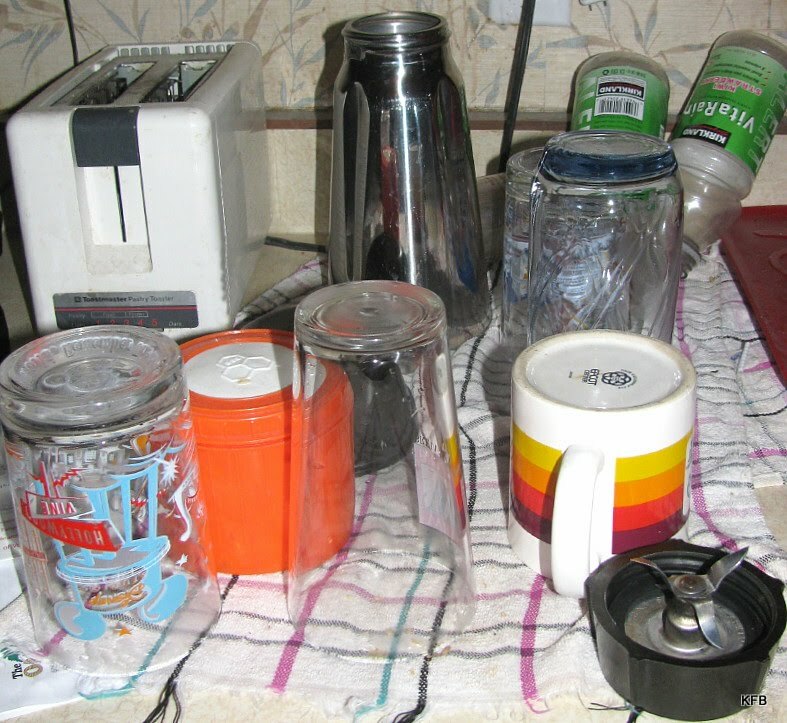 I suppose I should show you the upside down glasses and things left to dry next to the dish drain. Here they are. The striped mug is from Disney's Epcot Center, and the colorful glass has a Walt Disney World theme. John sent me out to Long John Silver's last night for fish and chips. 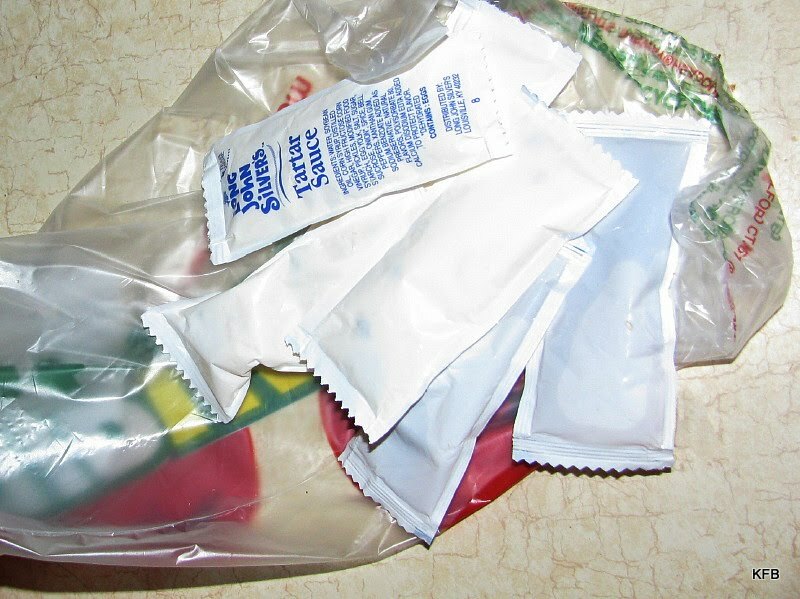 We ended up with way too many fries and an over-generous supply of tartar sauce and vinegar packets. And finally, here's a vague approximation of the shot I've been trying for all week. 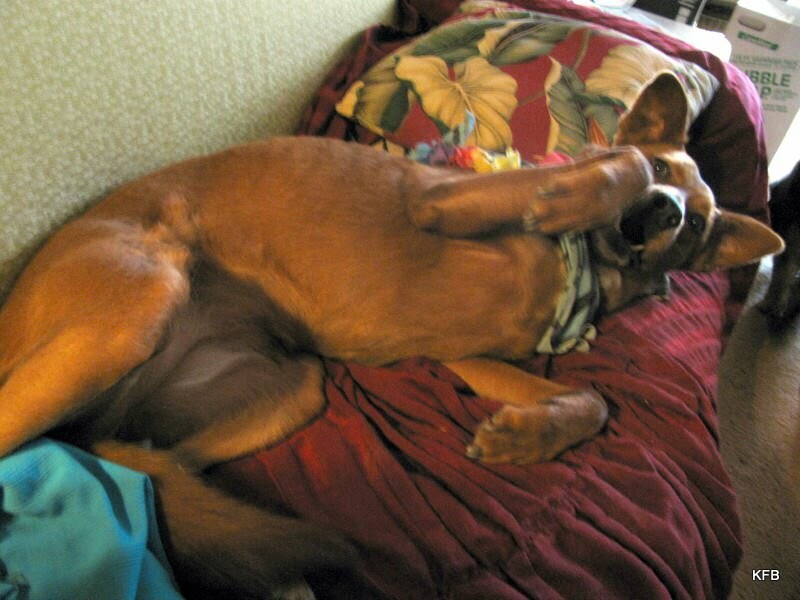 Cayenne rolls onto her back quite often in a bid for attention. But when I've had the camera in hand, she's mostly only rolled onto her side. Ah, close enough! It's that time again! For Round Robin Challenge: Land Or Sea, (as suggested by Carly), there was never any chance that I was going to get to California's Salton Sea to take pictures, let alone to an actual ocean. So Land it is! Fortunately, there's plenty of that in metro Tucson. The most interesting land around here is up one mountain or another, so that's where I went. 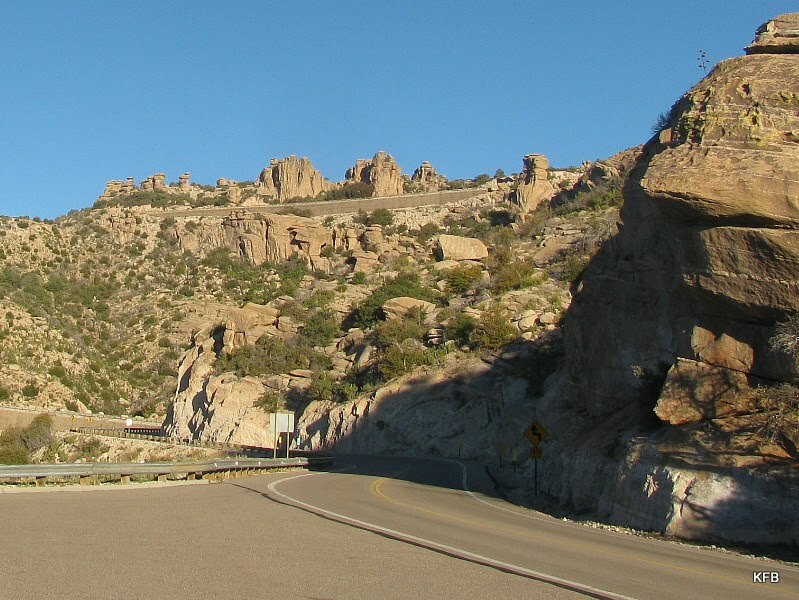 To make things extra interesting, to fit this photo shoot into my schedule, and because I was up all night anyway following the UK election, I went up Mount Lemmon Highway at dawn, trying for a sunrise photo or two (or more). John had estimated that dawn would be at about 5:30 AM local time, and my 5:10 AM or so departure worked out perfectly. The sky was already light, but the sun had not yet cleared the mountains that ring the city. When I reached Babad Do'Ag Vista, site of many a photo shoot, daylight was starting to steal across the valley below. But no sun yet! No, this isn't a Stairway to Heaven. This is the ruin of a prison camp. Please see my entry about Gordon Hirabayishi, a college student who challenged the constitutionality of internment camps for Japanese American citizens. This outdoor "Honor Camp" is where he served his sentence for breaking curfew. 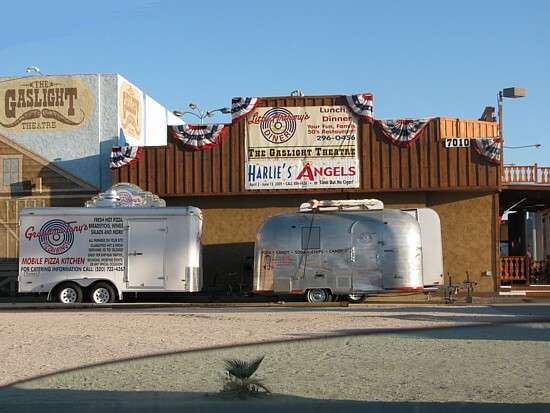 The site is now a recreation area, named in his honor. Again it was daylight, but the sun still have not yet cleared the horizon. Pushing on from the Gordon Hirabayishi Recreation Area, I played hide and seek with the sun. Down in the city it was almost certainly daylight, but up here as I climbed - 4000 feet, 5000, 6000 fee in elevation - mountains and rocky outcroppings and tall trees kept getting in the way. Somewhere around the Middle Bear picnic area I found a pullout and risked standing in the road long enough to take this shot. Above General Hitchcock Campground but before Windy Point Vista, I found Manzanita Vista, where I'd never pulled over before. 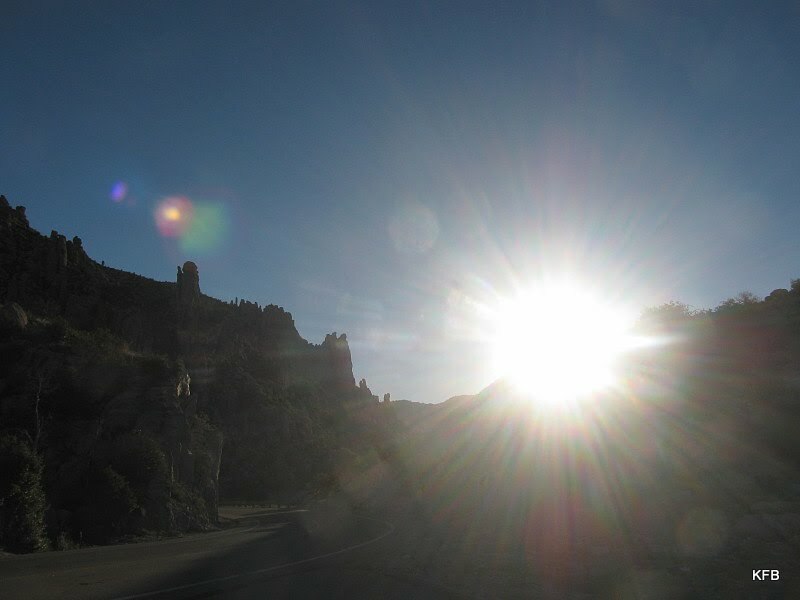 Here I was able to make the sun rise over and over, just by stepping a few feet in one direction or the other. 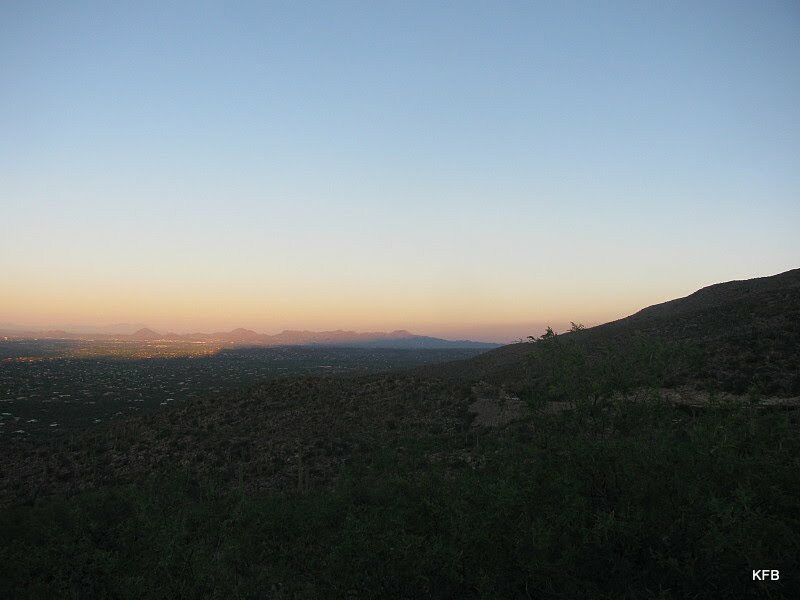 In the other direction, during that same minute, Mount Lemmon was in full daylight. Well, mostly. in which I drive back down the mountain. The Linking List is there too, so you can see what the other Robins have come up with! This is a continuation of the entry above. Please scroll up if you haven't seen it, and then come back for this one. 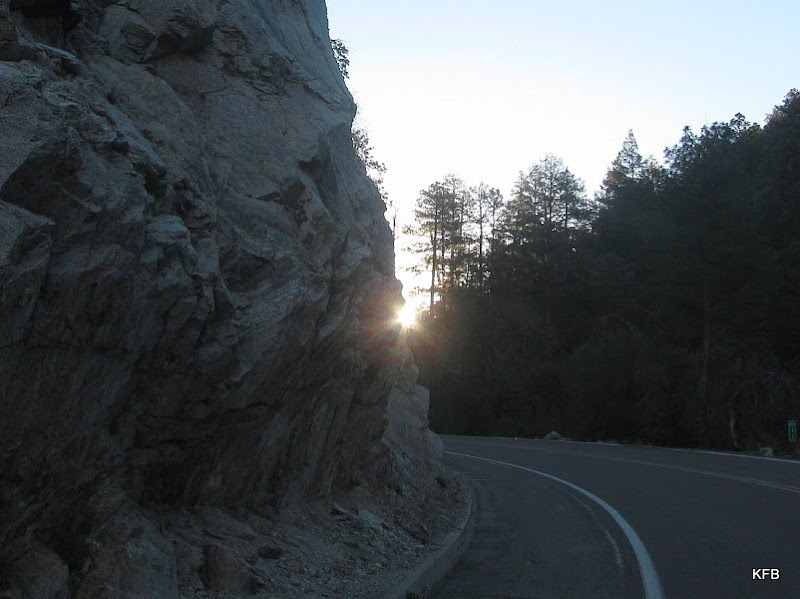 For the Round Robin Photo Challenge Land or Sea, I chased the sun up Mount Lemmon Highway on Friday morning at dawn. After Manzanita Vista, I started back down the mountain, pausing for a few more shots along the way. Daylight still had not penetrated everywhere. 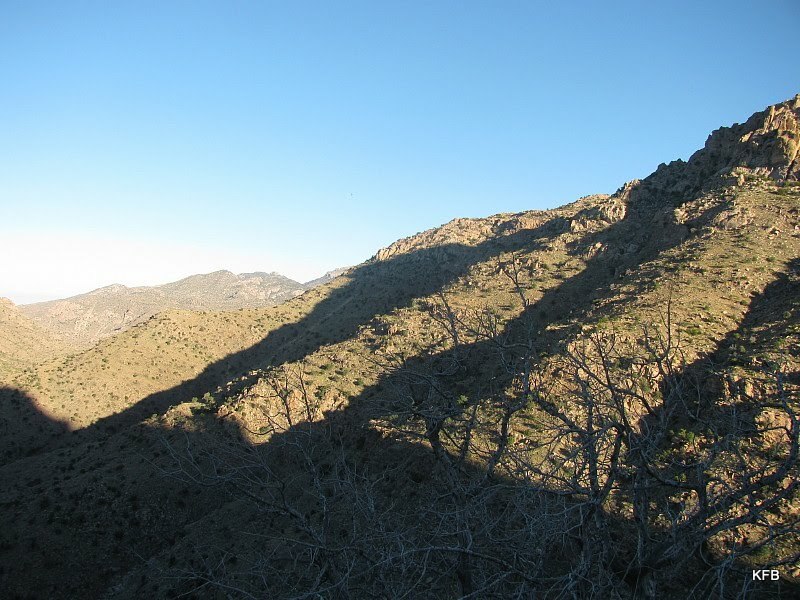 Then again, the late afternoon shadows have much the same effect on the mountainsides. I had noticed a cardboard sign at Molino Basin Vista that read, simply, "CABA." I'm assuming it was a meeting place for a bicycling group. 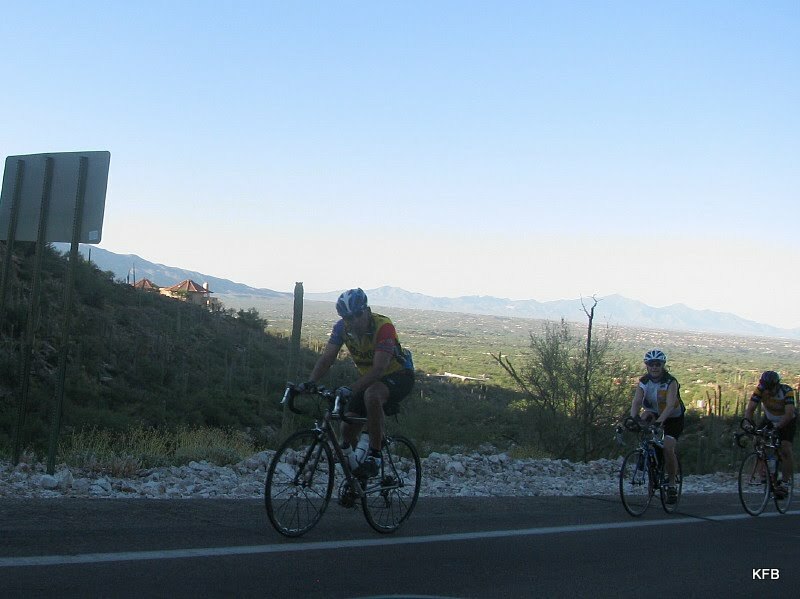 From there to the bottom of the mountain and along Catalina Highway between the mountain and the city, dozens of cyclists were riding, onward and upward. Even by then they were only in the sun part of the time. Incredibly, I also saw a jogger around the five mile mark, jogging up the mountain. As for me, I was coasting on four wheels and frequently hitting the brakes, conserving what was left of my gas. And yes, I did make it all the way back to my neighborhood gas station. So that was my morning adventure. 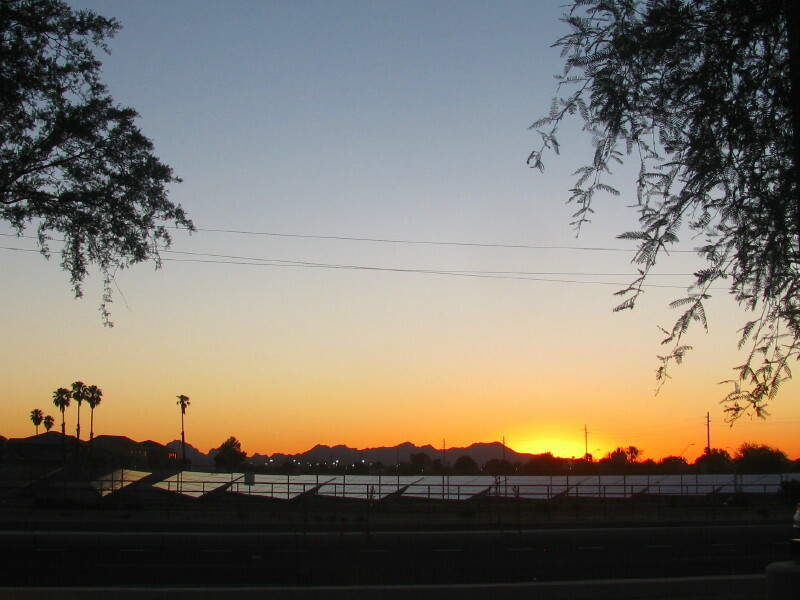 Then at dinnertime, the sun fell to again meet its lover the land - and to close out a day of powering up the solar grid by Davis-Monthan Air Force Base. Now let's go see who else chose to stay close to the land, and who went to see the sea!